Decorating your porch for the fall season is always a mini celebration because it means our hot-Texas summer is over and cooler temps are coming soon. 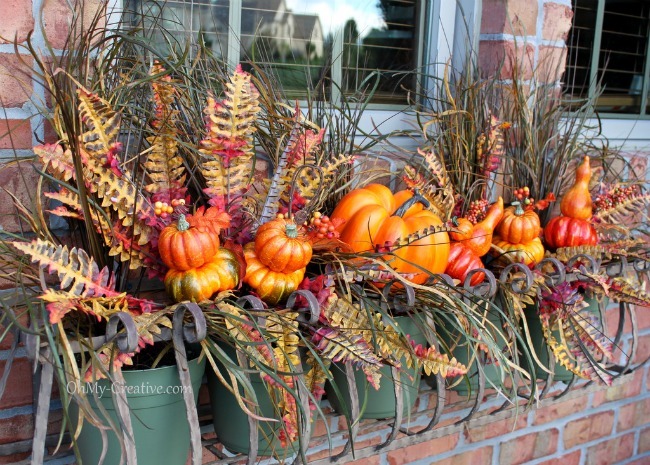 We love to look at fall porches and wanted to share a few with you we found in the blog-o-sphere. This is the look at Two Funny Girls HQ right now. Good Housekeeping found this gorgeous planter box. This blogg er used sing silk greens and pumpkin picks from JoAnn Fabrics! How easy and simple is that? We love the look and it can be stored and used again for years. 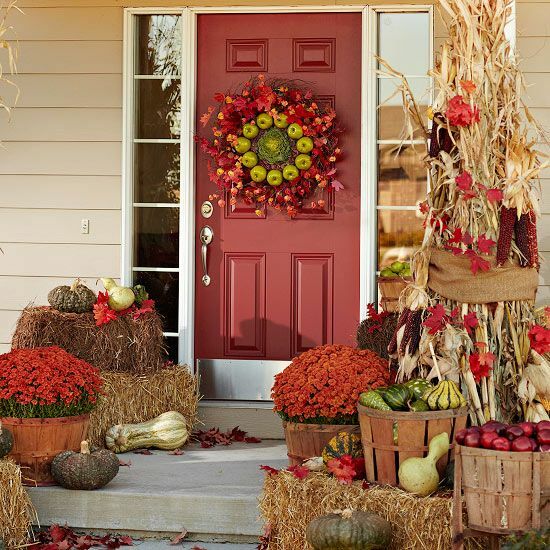 Our friends at HGTV created a welcoming entry for guests with a display of fall-themed items around your front door. Traditional favorites like pumpkins and bales of hay, layered with mums in rustic wooden baskets, create a color theme of orange and tan, with an emphasis on natural elements. Swoon. To decorate your porch for fall, don’t forget the apples! This wreath made of (I am assuming) artificial apples and leaves is the most creative wreath ever. How did we ever come up with ideas without Pinterest? This porch is styled with so many fall decor ideas. Again, swoon.